Material: Made up of Wood. Painted wooden stumps with 2 half bails or 1 single full bail, steel reinforcement on bottom & top. Our range of these Wicket Stand Sets is fabricated using superior quality materials that are tested for their quality and efficiency. Our range is highly demanded in national and international markets for their long functional life, durability, efficiency and optimum performance. Clients can avail these at nominal prices in the market. We are dedicatedly involved in providing an excellent quality array of Cricket Sport Stump, for catering the various needs of our clients. OSLO White Stumps, Size: 28 "
The company is a well-established Exporter & Supplier of Spring Back Stumps. The Spring Back Stumps, offered by the company, are known for their peculiar property of bouncing back when hit. 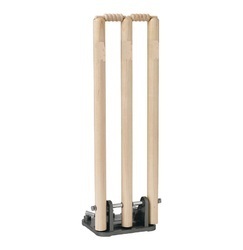 - Available in 31" , 27"
Wooden cricket stumps and bails as per international standard size and weight. 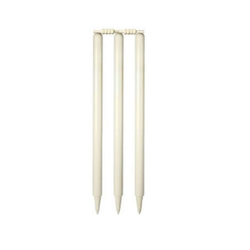 Can be supplied with stickers of the buyers and also coloured stumps are available as per choice of the customers.